How much is enough to make innocent men whole after they've spent nearly five years in prison for a crime they didn't commit? The answer, apparently, is $2.25 million — the amount that Spokane County's insurer agreed to pay to settle a federal civil rights lawsuit that alleged "reckless" detective work and witness tampering by police. But for the three men wrongfully convicted of an armed robbery in 2009, there are some holes in their lives that money will never fill. "It devastated me and my family," says Robert Larson, one of the three wrongly convicted men. Larson says the strain of his conviction contributed to his parents splitting up. Then, his father died only months after Larson was released, he says: "I can't describe it." 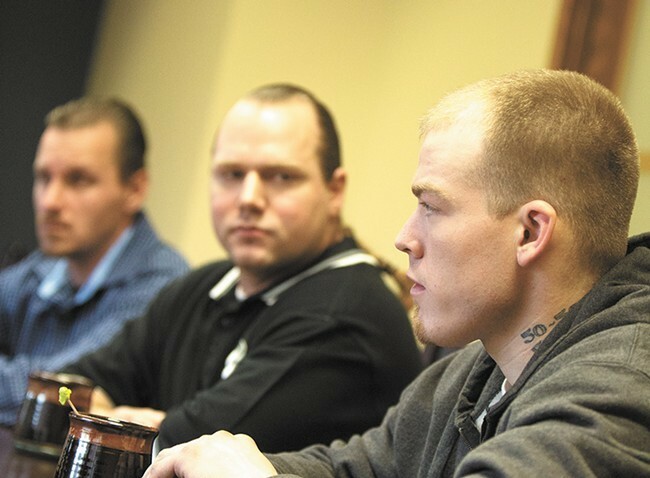 Larson, along with Paul Statler and Tyler Gassman, were released from prison in 2012 after their convictions were overturned. They've been working to rebuild their lives and clear their names ever since. "I don't think it's enough money for what they went through, but it's our hope that it helps them move forward, and that the Sheriff's Office takes it very seriously and takes steps to prevent this from happening in the future," says Micah LeBank, the men's attorney. Following the agreement, however, Spokane County Sheriff Ozzie Knezovich told the Spokesman-Review that he believes the case should have gone to trial and "all the way to the U.S. Supreme Court if necessary." "They had no case, and that is evident in that they received $750k each," Knezovich writes via text message to the Inlander. "A case like this is valued at $15-20 million each if true. Settlements happen when [the] plaintiff has a weak or no case." In sworn testimony ahead of the settlement, Knezovich has defended the work of the two detectives — Bill Francis and Doug Marske — whose problematic investigation led to the bad convictions. Knezovich says the detectives conducted a thorough investigation, despite his own sergeant's conclusion to the contrary following an internal review. The sheriff's reaction is typical of other high-profile settlements with his office. Knezovich criticized the county's $2 million settlement in 2013 with the family of a Spokane Valley pastor shot to death on his own property by a deputy. "Frankly I think our community deserves better leadership." More recently, following the $1 million settlement with the family of a Spokane Valley teenager who died after he was hit by a speeding deputy's vehicle, Knezovich took the opportunity to absolve his deputy of blame. Holyk's mother, Carrie Thomson, says the sheriff has misled the public about details of the fatal accident from the very beginning. "Frankly I think our community deserves better leadership," Statler says of the sheriff's reaction to the settlement in his case. "That guy shouldn't even be where he's at," Gassman says when asked about Knezovich's response. "He allowed this to happen. I feel like it's his job to say that." As for the case itself, the men's convictions hinged on testimony from a jailhouse snitch, which turned out to be false. Sheriff's Office Sgt. Tim Hines, who looked into claims that a detective lied and tampered with a witness leading up to the wrongful convictions, called the investigation "extremely poor police work." That included detectives' failure to verify essential pieces of evidence, including the jailhouse informant's statements. "As far as efforts to corroborate it, it doesn't appear they made any," Hines says in his sworn testimony. He adds: "I wouldn't have had to ask somebody 'should I try to corroborate this?' I would've known that. That's common sense." Aside from the federal lawsuit, taxpayers could also be on the hook for the detectives' missteps to the tune of about $750,000. This year, Spokane County Judge John Cooney declared the men "actually innocent," meaning they are entitled to compensation under the state's wrongful conviction statute. That bill for taxpayers comes to about $750,000, according to the attorney handling that portion of their case. But it's unclear whether Statler, Gassman and Larson will get that money. Washington's law says individuals must waive their right to sue in order to receive state compensation. LeBank believes they'll still get paid by the state. "There's been finding of fact and conclusions of law indicating they're entitled to money under the statute," LeBank says. "The state now has to pay that money, and nothing in the statute allows them to avoid payment. If the state chooses to fight it, in my opinion, that's frivolous." During phone conversations with the Inlander, each of the three men expressed relief that they're finally able to put this behind them. Gassman is working in construction and says he's looking forward to spending time with his family. Larson found work as a drug and alcohol rehab counselor and is focusing on raising his three kids. Statler is also raising a 2-year-old, and says he's working on publishing a children's book. "Nothing can ever replace the time we lost, but I'm glad to have this jump start and help my son move forward," he says. "For me, I just want to raise awareness about the issue, and about the dishonesty of the police — hopefully get some policies changed." This post has been updated with Sheriff Ozzie Knezovich's statements. Knezovich strongly disagreed with the Inlander's headline, saying: "Bottom line is [the] headline is false, but what's new? Good thing there is no IA process for the press. They'd find this one fake news."